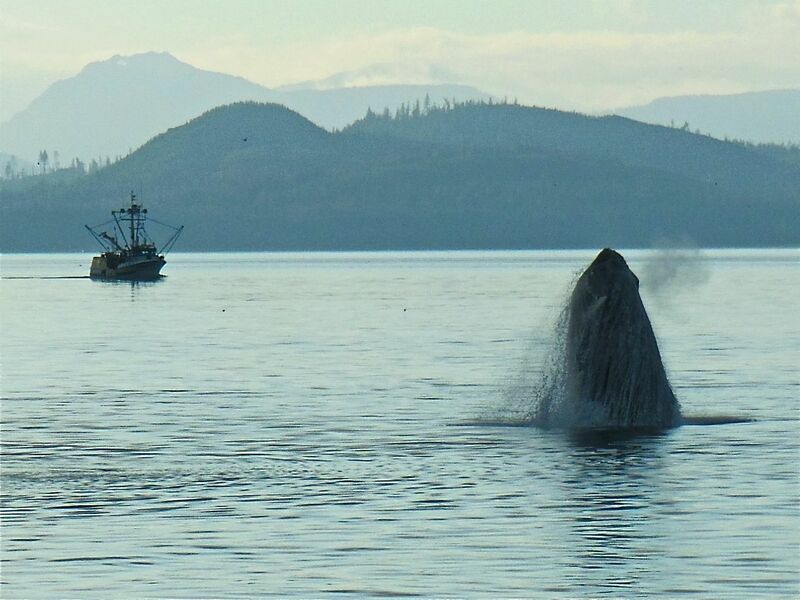 If you think whales are cool, raise your hand (fin). Sadly, when Rick came out to look, the whales had either taken a rest or moved to another area we couldn’t see, so I had to do a dramatic re-enactment of the whale show. 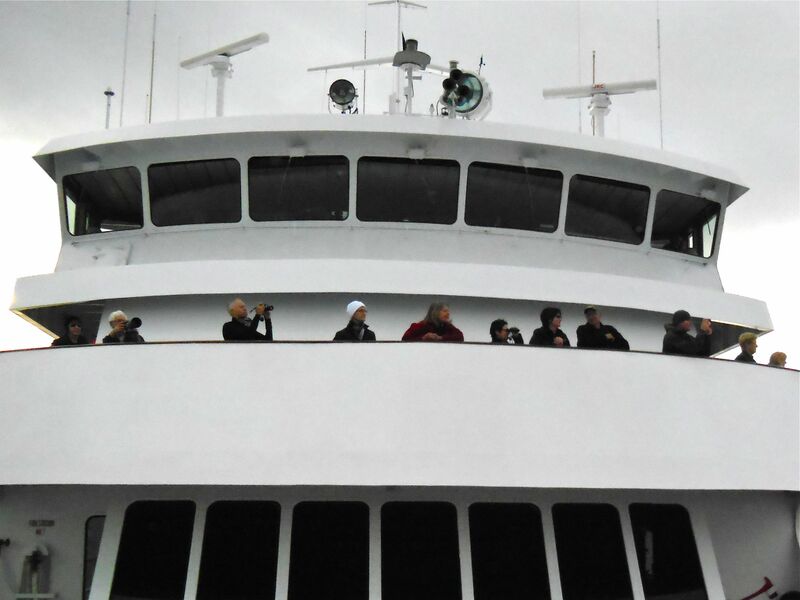 The photogs on the upper deck stand poised to capture the perfect shot of a whales in action. Camera in hand, I headed up with Rick to the main deck so we could look for more whales. And boy, did we find them. Along with our fellow guests and some of the crew, we stood in silent awe of the powerful and elegant whales that were all around us. The only sounds you could hear were the exhales of the whales, the crash of their fins as they shattered the surface of the water, and the staccato shutters of sixty cameras. We were all stunned to silence as we watched how beautifully the whales moved in and out of the water. Now what we were seeing (according to our crew) was highly unusual. Sure, they had seen whales breeching and engaging in fin-slap behavior, but they said they had never, I repeat, never seen the whales go non-stop for so long and exhibit such flamboyant movements as they had that day. Captain Jill and our Expedition Leader Matt agreed to adjust our schedule for the day so we could linger and enjoy this unique experience. For about two hours, we were able to observe the graceful water dances of these whales without worrying about having to rush off to be somewhere else by a certain time. This gave us an exceptional opportunity to observe and discuss what whales do and why. There’s speculation about what the slaps and jumps mean: Is it to attract a mate? Does it stun the tiny animals they’re about to feast on? Is it a way to “scratch” the tiny organisms that live on and irritate their skin? Is it all of these things? No one knows for sure, but it sure is fascinating to watch. Ready to make his big move, this Humpback goes tails-up for a deep dive. It also gave us a chance to witness the patterns of these particular whales, which was a real blessing when it came to capturing the moments on camera. 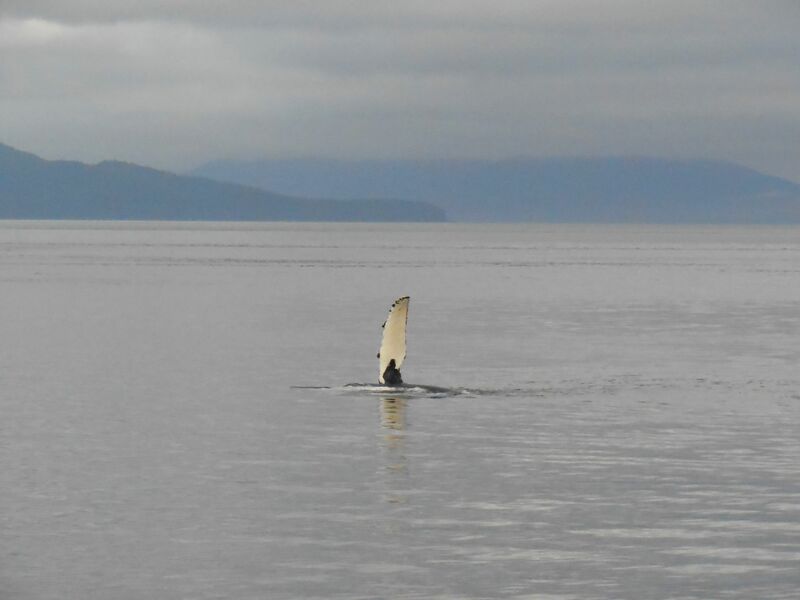 One whale consistently did a series of fin flaps – first one fin repeatedly and then alternating each side. After a few minutes of that, you’d see his humpback emerge and descend, followed by his tale. And that was the signal. Once that happened, we knew that in a few minutes (or in a few seconds), he would make his big move. The problem was, you never knew exactly where he would breech. I had so many blurry shots and remnants of after-splashes because I wasn’t quick on the draw. But when whale action, presence of mind, quick reflexes, timing, and luck converge, you find yourself wanting to jump up and down, just like those whales. Previous Post To Cruise Or To Un-cruise? LMAO at the dramatic re-enactment!! Best start to a Monday is some hearty belly laughs and then a tear for the beauty and blessing of nature. Thanks for sharing!! Thanks for following the blog, Michelle. You’ve always been there, championing me in all my endeavors. For that, I am truly grateful. And I’m glad I could make you laugh and cry all in one blog post. 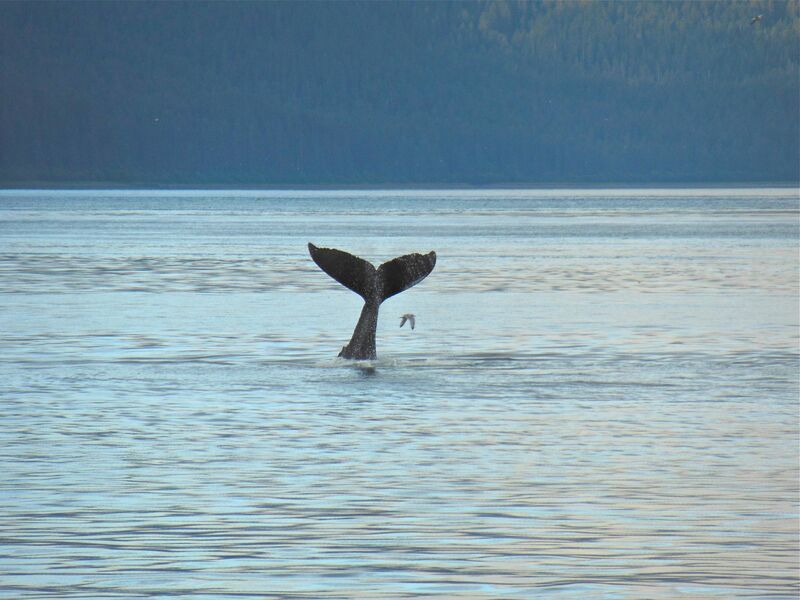 We were in AK at the same time – on a 2-week cruise on one of those mid-sized ships. It was our 2nd trip & we love that beautiful state. Your re-enactment is spot-on. Love it! Wow! Two weeks! I would have loved another week up there. Thanks for reading the blog/watching the video. I’m not sure I did those magnificent creatures justice, but I’m glad you enjoyed it. Take care!